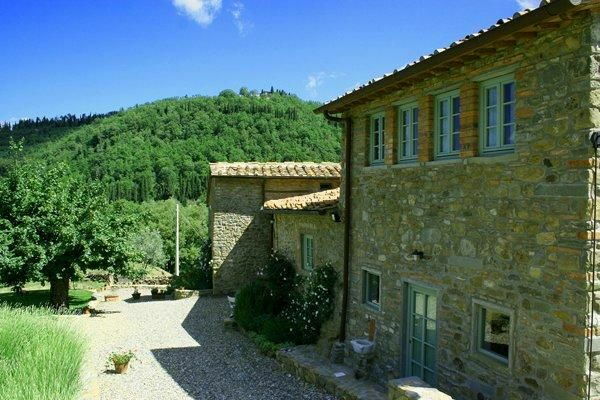 Beautiful stone farmhouse dating back to the 13th century once used as a watch tower situated in quiet and panoramic location with extensive views over the surrounding landscape. The villa has been recently and tastefully restored and turned into 4 comfortable apartments, all of which offering charming interiors furnished with antiques. The owner lives on the premises, in one of the apartments. This property is not recommended to families with children up to 14 years old. Pets are not allowed. The rental price includes 1 hour maid service a week (towels and linen change is not included). The access to the property is via an unpaved but well-maintained road. Distances: San Polo in Chianti with all kinds of shops 2 km, Figline Valdarno 12 km, Grassina 12 km, Firenze 18 km, Ugolino Golf Club 14 Km, manège with possibility to organize ridings just 15 minutes away. At guests’ disposal: beautiful terraced shared garden furnished with garden furniture. Parking within the grounds. Extra services: maid service available by arrangement (to be paid locally). During high season a 10% reduction is granted for reservations longer than 1 week. 115 m2. Ground floor (accessible via 4 steps): living-room (satellite TV), dining room with kitchen corner (oven, dishwasher), laundry with washing-machine. 1st floor: double bedroom with ensuite bathroom with shower, twin-bedded room with ensuite bathroom with shower. Additional costs paid on site: Security deposit: € 300,-Final cleaning: € 100,-Heating: according to consumption.